The White House envisions McAleenan working more with Congress, one official said, though the official declined to be specific about policy details. McAleenan is a rare Trump appointee with cordial relations with Democrats in Congress. President Donald Trump’s new acting chief of Homeland Security will be under pressure to implement legally dubious solutions to an influx of migrants at the U.S.-Mexico border – policies that his predecessor either could not, or would not, deliver. 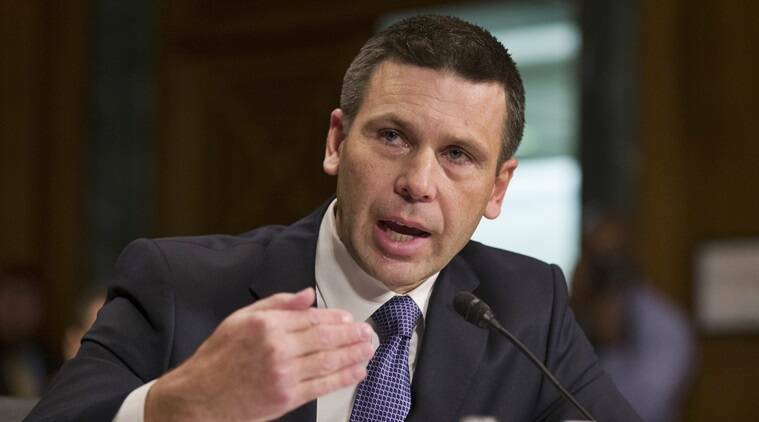 Kevin McAleenan, presently commissioner of U.S. Customs and Border Protection (CBP), will be the fourth person to helm the agency under Trump. He takes over as U.S. border officials estimated that 100,000 migrants were apprehended at the southern border in March, the highest level in a decade. The president, who made immigration a key campaign theme, has grown increasingly frustrated with his officials, even as they have implemented aggressive policies to limit immigration. Immigration experts say Trump lately has called for policies that would violate U.S. laws, international agreements and court settlements or require U.S. Congress to pass major legislation. On Friday, he called for Congress to “get rid of the whole asylum system” and get rid of immigration judges, and criticized a long-standing federal court decree mandating certain standards of care for migrant children. A congressional official familiar with the matter said some in Congress believe Trump forced out Kirstjen Nielsen, who resigned as secretary on Sunday, in part because she was trying to obey laws on treatment of refugees, granting of amnesty and separation of families. Nielsen did not respond to a request for comment. It was not immediately clear what strategies McAleenan could implement to achieve Trump’s objective of limiting migrant crossings at the southern border, especially as they are expected to reach their yearly peak in the coming months, experts said. A CBP spokesman declined to comment and directed questions to the White House. McAleenan follows Nielsen and Elaine Duke, who led the DHS on an acting basis after John Kelly, Trump’s first DHS secretary, became White House chief of staff in 2017. Trump took office in January that year. The White House envisions McAleenan working more with Congress, one official said, though the official declined to be specific about policy details. McAleenan is a rare Trump appointee with cordial relations with Democrats in Congress. After testifying before the Senate Judiciary Committee in December, McAleenan chatted afterwards for close to 15 minutes with Senator Dianne Feinstein and other Democrats on the committee. “He’s not considered to be radioactive,” said a congressional Democratic aide on condition of anonymity. Democratic Representative Joaquin Castro demanded McAleenan resign in December, after a Guatemalan migrant girl died in federal custody and McAleenan failed to report it to Congress within 24 hours, as required. On Sunday, he said McAleenan’s appointment as acting secretary was “deeply disturbing.” Trump further reshuffled the Department of Homeland Security (DHS) on Monday by replacing the director of the Secret Service – which does not have immigration responsibilities – with a career agent.